Home Forum General Discussions & Questions Hello. Just joined. Hi, all. I've been visiting these forums to read up on for a while. I'm 51 and have only been shooting for a couple years. I started with a Henry .22 lever, upgraded soon after to a 1976 Win 94 in 30WCF. Last April, I bought a 1926 vintage 1894 SRC, then got sidetracked by some milsurp bolt actions. Finding a 1912 Model 1892 SRC in 38WCF last month got me back to my first love, lever actions. I now have a 1893 Model 1873 rifle in transit, also 38WCF. Yay for cashing in unused sick time! Since I will soon have four Winchesters, I figure I've officially entered Collector status, so here I am! Welcome to the forum (and affliction). Feel better soon! welcome! I too just joined and am a new Collector. My first acquisition was a 1949 Wincester Model 62A .22. I just bought my first Model 1894- a 1976 Bicenential 30-30. I'm looking forward to learning more about the hobby and e pAndibg my collection. Ive been reading some of the comments about getting younger people into the hobby. I'm 43 years old and just starting my collection. I have limited knowledge and funds to apply to my collection so am looking forward to learning from other on this forum to learn and make smart buying decisions. It is never too late to join this group of demented, misfit, and just strange Winchester collectors (myself included)! Can you provide a list of which specific models you are seeking assistance with? We have WACA members that specialize in specific models, and can provide answers to any questions you may have. Welcome, JB, Doug, and Heman. 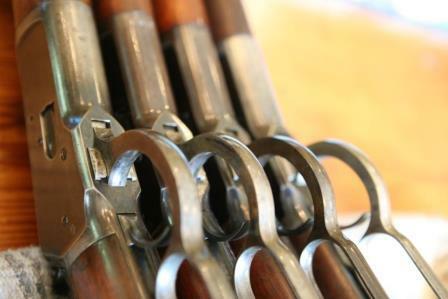 You will find this organization to be the best group of knowledge for collecting Winchester's. The WACA experts have helped me tremendously over the years. I've been collecting for only about seven years, so compared to most folks here, I'm a relatively newcomer. New members beware, the addiction is real! the amount of information you can learn is simply awesome. Welcome Todd and Herman. Bill is 112% correct with both points. Welcome to the party! I will be happy to help with any questions on your 1892. Hello, Michael. The 1892 is the one I posted over in the survey thread, with the deer carving in the stock. Add Reply: Hello. Just joined.